Chilling requirement: 450 hours to 550 hours. Bloom time: Blooms seven to 10 days after Climax. Blooms late February - early March in the southern growing region. Ripening period: Ripens late May to early June, about the same time as Climax, in Southern Mississippi. Plant yield, vigor and growth habits: Plants are productive, vigorous and upright with narrow crowns. 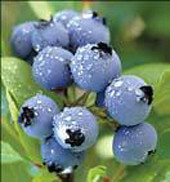 Berry quailties: Berries are medium size and have good color, firmness, flavor and small dry scars. Drawbacks: Fruit size has been smaller than expected under some conditions. Variety replacement possibility: Alapaha is considered to be a potential replacement for Climax. Breeding history: Released jointly by the University of Georgia and the United States Deparment of Agriculture-ARS in 2001; patented.